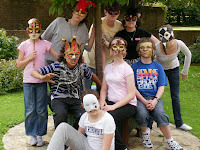 As I write, my drama school’s summer activity week is in full swing with sessions on mask, magic, stage fighting, bollywood dance, circus skills, putting on a play and a trip to the Birmingham Repertory Theatre. About 40 youngsters aged 5 to 15 are taking part and thoroughly enjoying themselves whilst learning. Last week I had the pleasure of working with 15 fantastic young people at a residential theatre school in Lincoln. We hear so much about people getting into trouble, but my experience is very different. I thought you might like to know what they achieved in the week…. Seven years ago I was invited to be a tutor for the Betty Yager Summer School at Bishop Grosstette College, Lincoln with my colleague from Manchester, Marie Dixon. We wrote a production, putting together words and music on a theme and they liked us, so we’ve been back every summer! This year, our theme was ‘ A Theatrical Life’ and we met the youngsters aged 11 to 17 on Monday when they had drama workshops before auditioning with a prepared acting piece or poem and a song. We then cast according to their strengths and began rehearsing on the Tuesday morning. On Saturday night they performed two 40 minute halves with full lighting and costume in a modern theatre in front of an audience of family and friends plus the Mayor and Mayoress of Lincoln. During the week they had learnt all the words and moves for five song and dance numbers (including ‘Anything Goes’, ‘Brush up your Shakespeare’ and ‘Fame‘). Group items included ‘Gus the Theatre Cat’, a short Victorian melodrama, Nell Quinn, ‘St. George and the Dragon’, ‘Send in the Clowns’ and ‘Don’t put your daughter on the stage’ by Noel Coward. They worked together like an established company although they had never met before the Monday. They hardly ever had to be reminded to pay attention and most of the time retired to their rooms when asked! (well, boys will be boys and teenagers will be frisky!). It was a great experience and they were a pleasure to work with so you won’t find me complaining about young people. By the way, the lady who masterminded the week gives up a week of her holiday each year to do it and manages to persuade companies like W.H. Smith to give her sponsorship so that the children only pay around £230 for full board and all the excellent facilities. If you know a keen youngster aged 11 to 18 who might like to attend next year from July 26th to 31st, please email Jane Holmes at bjholmes@talktalk.net. On the business front I did several days of examining during July in Solihull, Stamford, Northampton and Borehamwood. I also spoke at three business meetings: ‘Connecting Women’ in Tamworth, The Chartered Institute of Management in Nottingham, and The Hinckley Business Association. I also enjoyed volunteering for the Leicester Education Business Company as a business mentor at English Martyrs School, Leicester where they were staging a fashion show of their own recycled clothes made from paper and recycled fabric. Two outside entertainments were attempted – early in the month we went to see ‘Crazy for you’ at the Kilworth House Hotel Theatre – another excellent production from this inspired venue. Then it was Beaumanor Hall for a classical concert (in which my husband was performing as principal trumpet) and a grand firework display in aid of the British Legion. We started off all right but as the Hurricane passed over heads the heavens opened and a sizeable part of the concert took place through a sea of umbrellas, pac-a-macs and slightly soggy quiche slices! Hundreds of very wet Britains waving flags and singing Rule Britannia in a slightly hysterical fashion must have been a sight to behold! Speak Wisely, Speak well, Speak Loud & Clear!